The famous war machine of the Vegan military force. Fight the good Prince Duke Fleed with your UFO Robo Grendizer Metaltech Giru Giru Action Figure! Made of 56 different parts. Features 16 points of articulation. Changes from saucer to deadly turtle form. Own the Giru Giru Figure imagined by series creator Go Nagai! The famous war machine of the Vegan force as imagined by UFO Robo Grendizer anime series creator Go Nagai is now an incredible action figure. The UFO Robo Grendizer Metaltech Giru Giru Action Figure is right out of the cult-classic super-robot anime TV series UFO Robo Grendizer. Made of 56 different parts and featuring 16 points of articulation, including forward and backward leg articulations, this Giru Giru Action Figure can be manipulated in all sorts of really cool ways. 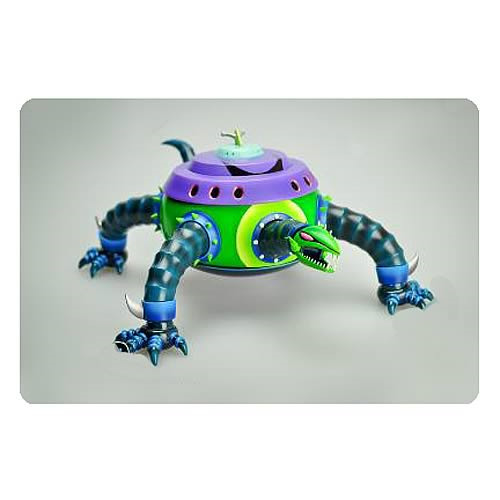 He can even be changed from saucer to deadly turtle form! Whether you grew up watching Prince Duke Fleed protect Earth against Giru Giru and the Vegan military on UFO Robo Grendizer on Fuji TV in the late 1970s or you just think this die-cast figure looks awesome - and he certainly does - you're going to love this UFO Robo Grendizer Metaltech Giru Giru Action Figure! UFO Robo Grendizer was an anime series that was broadcast on Japanese TV from 1975 to 1977, and soon became popular worldwide, particularly in the Middle East, France, Quebec, and Italy. More importantly, UFO Robo Grendizer featured the undoubtedly super awesome Grendizer robot that fought against King Vega and his evil Vegan military. This is your chance at your own Giru Giru robot! Measures 6-inches tall. Ages 16 and up.